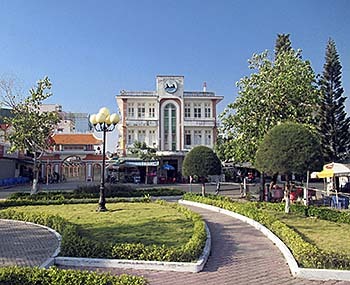 The smaller town of Ha Tien (Vietnamese for: River Spirit) lies in Vietnam's deep south at the Gulf of Thailand. It has a population between 40,000 and 50,000 people and is situated only 7km southeast of the border to Cambodia at Prek Chak. The landscapes are coined by Giang Thanh River and it's mangrove forests, wide, swampy plains and a hill chain along the coastline. Ha Tien is a weekend and holiday destination for many Vietnamese people from the wider area around. 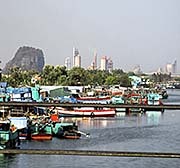 The town looks widely proper and clean, at least apart from the market area near the large bridge over Giang Than River. It's of the kind of the towns who look completely newly made. The almost complete absense of any historical building or trace is very remarkable for these de-traditionalized places. However, there are some French influences to see in the architecture. 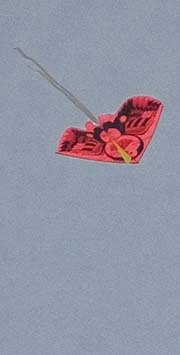 Besides, Ha Tien is, as to expect, another boomtown in Southeast Asia. On a southern peninsula a completely new part of town is under construction, and the place spreads more and more out into the rural surroundings. 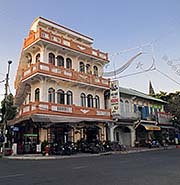 There are plenty of hotels and guesthouses in town, particularly in the center near the fresh market. At weekends, though, they all are booked out. One has then to find what in the northern city part. However, that's anyway the better part of the place, for it's cleaner and much more quiet. On weekends and holidays, Ha Tien is flooded with Vietnamese tourists who come here to enjoy the beaches and do karaoke at nighttime. 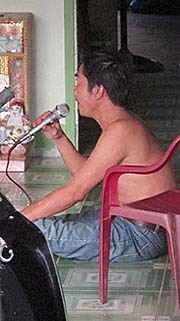 Plenty of karaoke bars are along the main road. In former years there was a pontoon bridge over the river, a few hundred meters north of the new bridge. It was closed in 2007, probably at the time when the new bridge was inaugurated. This bridge is pretty huge and long; it has one lane for each direction and much traffic is permanently running on it. For cyclists and pedestrians is no sidewalk implemented. I crossed the bridge on foot twice, but one has to be quite carefull. A broad, not too long and new river promenade stretches along the rivers western bank. Particularly nice is the refreshing, cool breeze which comes from the sea and is best to feel on the promenade. It looks as if it will be prolonged in the future. However, the many boats and ships on the river make a heavy din. The big ships in deepest, the longtail boats in highest sounds. It must be also a heavy impact for the underwater life. The new bus terminal has been moved in 2008 for two or three kilometers east of the town's center, on the other side of the river. That's certainly to provide travellers more unnecessary trouble and to require additional transport to and fro the station. 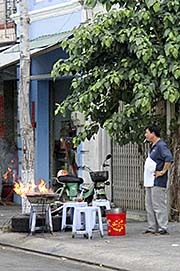 The place is rich in motorbike drivers who often apply for a drive. To the bus station a motorbike trip shouldn't cost more than 20,000 dong. On the eastern side of the river, in the slope of a forested hill, lies the buddhist temple of Tinh Xa Ngoc Tien. One has to climb some steps upwards to reach it, but it's worth the effort. One get's a good view over the wider landscapes. To the west one can look at least as far as to Kep; also Phu Quoc is well to see. There is a beach west of town. It's not too bad, but very touristic. Everything is styled and looks too artificial to feel well there. On weekdays there are few people, but on weekends it's certainly very crowded with families. To enter the beach area one has to pay an entrance fee at a ticket booth. Beside being a trade center and a tourist destination, Ha Tien has a large concrete plant which came in existence in 1961. At Giang Than River is also a ferry pier for the boats to Phu Quoc. At the time (3/2016) three ferries go daily to Phu Quoc; at 8am, 9:45am and 12am. The place has a history which dates back to the earliest times of Southeast Asian history, to the empire of Funan. It was mentioned in Ptolemy's geography as a seaport under the name Akadra. There is the story in the world, that Buddhism came to Southeast Asia through the port of Ha Tien in the year 415 CE, when a ship, which carried the famous emerald Buddha statue, which was later in Vientiane and is now a main attraction in Wat Phra Kaew (in the Grand Palace) in Bangkok, came in trouble in a storm and was forced to take refuge in the port of Ha Tien. Legend has it that Buddhaghosa, the most significant commentator of Theravada Buddhism, was aboard the ship. 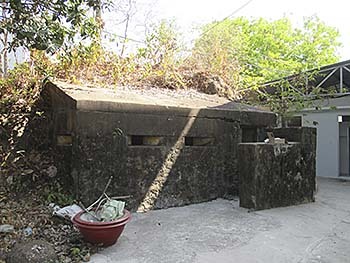 In the wider surrounding of Ha Tien, more than 100km eastsoutheast, lies the town of Oc Eo. It's better accessible from Long Xuyen. Oc Eo is as well a contemporary place as a significant archaeological site here in the Mekong Delta. Oc Eo was a walled town in the ancient empire of Funan. It was a lively place in the first six hundred years of the western calendar. 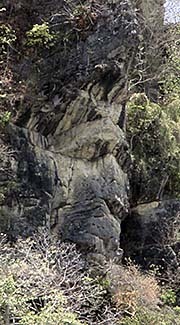 Oc Eo was discovered by a Chinese expedition in around 250 CE. The Chinese left the only written records of the place. They wrote it was a place with people living in stilt houses, with a king who lived in a walled palace, with brick built temples and a taxation system. Archaeologists found sanskrit inscriptions who refer to a king named Jayavarman who fought a battle against an unknown rival. Together with an extensive, sophisticated canal system used for flood control, irrigation and as a transport system, Funan was the first civilization in Southeast Asia. It is a classical example of an Oriental despoty (Karl A. Wittfogel) and slaveholder society. Oc Eo was connected to other places by it's canal system, which is still widely in use. One canal connected Oc Eo to Angkor Borei over about 80km length; another with a seaport at the Gulf of Thailand. Excarvations of the 450 hectar large site started in 1942 by the French archaeologist Louis Malleret. Most of the artefacts found here are now in the Museum of Vietnamese History in Saigon (Ho Chi Minh City). Among them are religious statues, pottery, jewelry and coins. There are also jewelry who were made as imitations of Roman coins. Oc Eo may have been the place which was known by the Romans as Kattigara (Cattigara), based on the geography of the 2nd century geographer Claudius Ptolemy. It could also be that Kattigara was identical with Ha Tien. The greek seafarer and merchant Alexander has reached the place almost 2,000 years ago. He was the first who sailed around the Malay Peninsular and came so far.